Here's one pizza that won't be going anywhere near an oven! 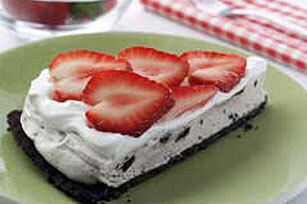 The ideal party dessert, this Frozen OREO Pizza serves a dozen, deliciously. Mix cookie crumbs and butter; press firmly into 12-inch pizza pan. Pour milk into large bowl. Add dry pudding mixes. Beat with wire whisk 2 minutes or until well blended. Gently stir in half of the whipped topping. Spread over crust; cover with remaining whipped topping. Freeze 3 hours or until firm. Arrange strawberries on top of pizza. Cut into 12 slices. Store leftover dessert in freezer. Savor a serving of this crowd-pleasing dessert on special occasions. Prepare as directed, using fat-free milk and COOL WHIP LITE Whipped Topping.